With yesterday’s cactus count embarrassingly low for a cactus trip, I thought that we’d play it save and repeat the day trip that we made from here in 2010 (6 December 2010), heading into the Andes, to a spot where we would at least see Austrocactus bertinii (?). There was a slight concern when we spotted long queues at the one and only petrol station in town (and for miles around!) but calculated that we had enough Nafta to make it there and back. Again, the drive to the Andes ‘proper’ was spectacular but after a few hours Angie made the point that ‘spectacular scenery’ was beginning to wear a bit thin. You should try it for a month, like in 2010! 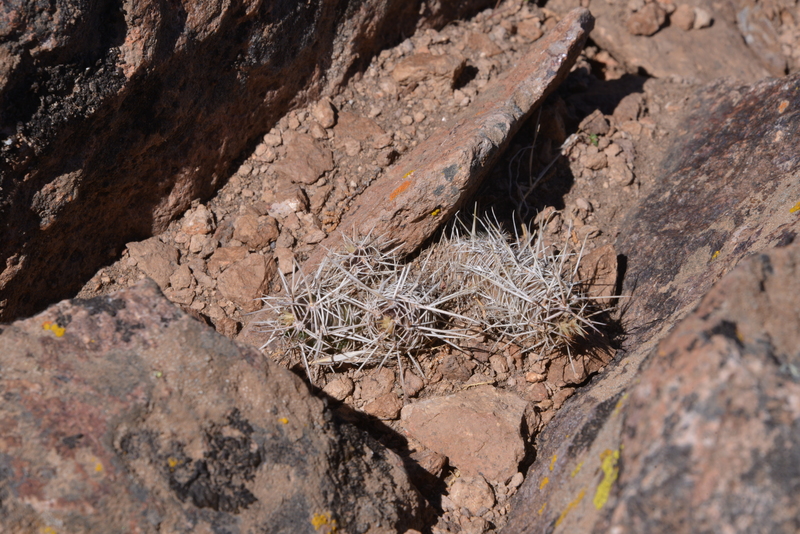 There were various places that I recognised as ‘2010 – no cacti found’ stops, so we drove past them. At Andacollo I spotted no cars queueing at the petrol station. Useful! or had they run out? In 2010, on a day called ‘Petrol Day’ in Argentina, when they celebrate their huge stock of this natural resource, most petrol stations were on strike! Was this a repetition? We reached Las Ovejas, a charming little village, almost deserted on a Saturday morning. And with a fuel station and an empty forecourt. Let’s give it a try. We were greeted by a lady who gains the award of the most attractive service station attendant found on the trip. Corny chat up lines such as ‘What is a beautiful girl like you doing in a place like this.’went through my mind, but just in time I remembered my age (and that of the chat up line) and though better of it. I could have gotten away with it, as she did not speak a word of English, but Angie had returned from snack purchases in the shop. Anyway – the car’s tank was full to the top. And of course there were no queues when we came back to Chos Malal at the end of the day, but it pays to be alert to unforeseen events. And so we drove on past Las Ovejas, looking for the sign of the Mirador (viewpoint) of La Puntilla. After too long, the road dropped down to a bridge across the Neuquen River and I knew we must have passed the spot. So this became our turn around spot. Back on the hill overlooking the river valley we decided to have a look around, but, although the area ‘looked right’ no cacti were found. It remains a challenge on these roads, particularly with numerous road works in progress to patch up the ripio, so when I found a place to pull off, I recognised signs that this was the place. 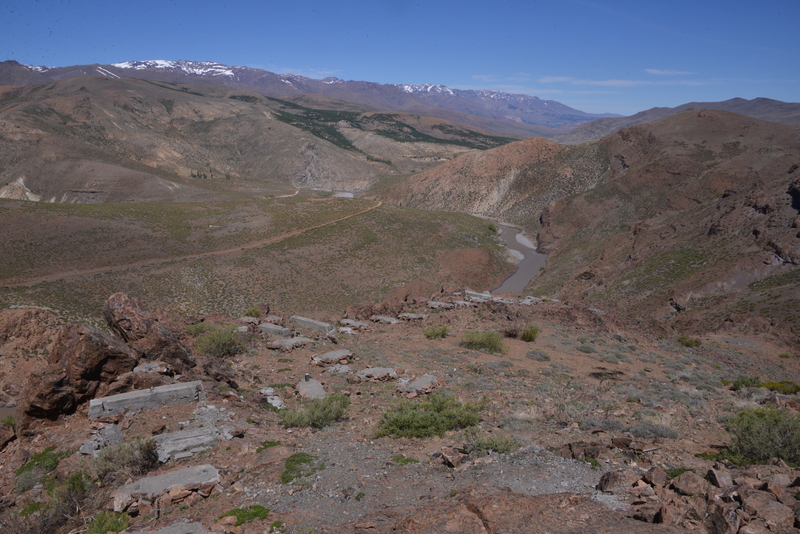 In 2010 there had been a formal car park and a wooden walkway led to the edge of the mountain side and offered a magnificent look onto the Rio Neuquen in the valley below. Except: now the foot path from the car park to the start of the walkway could hardly be seen and the walkway itself had been demolished. It had been a bit rickety in 2010 so perhaps health & safety had caught up with us, even in this remote place. I remembered the area where previously a dozen plants had grown. Gone – replaced by tracks of heavy equipment to demolish the wooden structure and the concrete base on which it had stood. 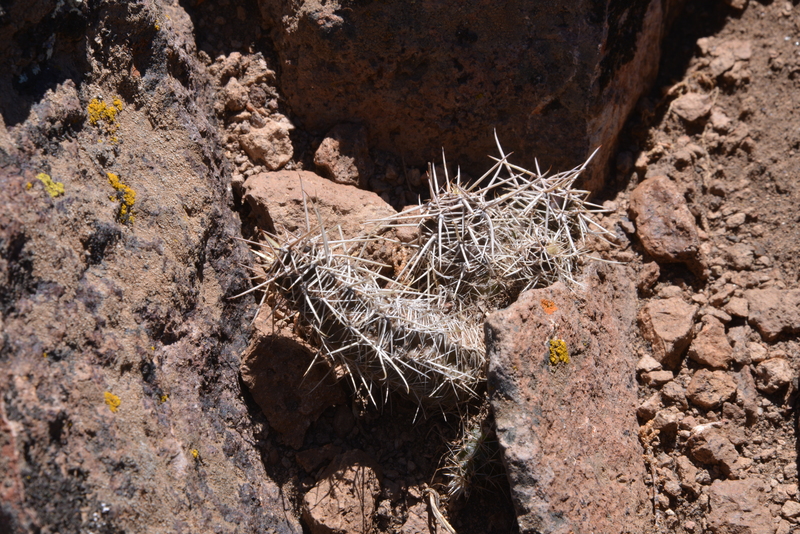 On this trip in Patagonia – if you see a cactus – photograph it! The challenge for tomorrow is to find enough cacti to appease Angie – even despite the spectacular scenery.